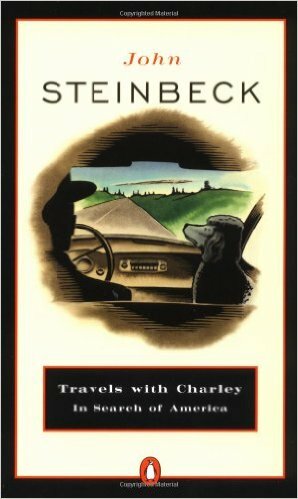 This is the story of John Steinbeck (author of the book) and his travels across America for 3 months with his dog, Charley. He had decided he wanted to see America, so he bought a truck with a trailer on top that he could live in while on the road. He packed the essentials and headed off. He meets several people on the road - inviting them to dine with him or just sit and chat. He meets Americans from all walks of life while traveling the countryside. He deals with his dog getting sick, and constantly getting lost before he returns home to his wife with a renewed sense of America and its people. I really enjoyed this book. At first, I have to admit, I was afraid I wasn't going to like it. Steinbeck talked very little about the actual scenery around him and the beautiful places he visited. He focused mostly on the people and what it was like to travel across the country. I thought at first this was odd, but then the writing too over, and I was hooked. He spoke beautiful about the people he met. He made me laugh with stories about his dog and how it was to travel with an animal for all of those months. In truth, I don't think Steinbeck was glad he went on this trip. I think, like most of us when we travel, have a delusion of what to expect when we go. And sometimes, the truth is not what we imagined, and it makes us wish we would have just stayed home. I think he met a lot of people across the country that upset him, and he missed his wife, and his dog got sick, and he was in a cramped space, and after awhile - it just wasn't what he was hoping for. This book had quite a few great quotes (I am a sucker for quotes) that I wanted to write here so that I can look back and remember them. "I was born lost, and take no pleasure in being found"
"I wonder why progress looks so much like destruction"
"A journey is like a marriage. The certain way to be wrong is to think you can control it"
"I suppose our capacity for self-delusion is boundless"
"The only good writer is a dead writer"
"Where the rich lead, the poor will follow. Or try to"
I really like Steinbeck. I haven't read anything of his in awhile, and never read this one, but I have a special fondness for him that I developed in college.